Mad-Libs have had a bit of a comeback in the world of weddings and parties - and "Wed-Libs" can be found at weddings all over the world. 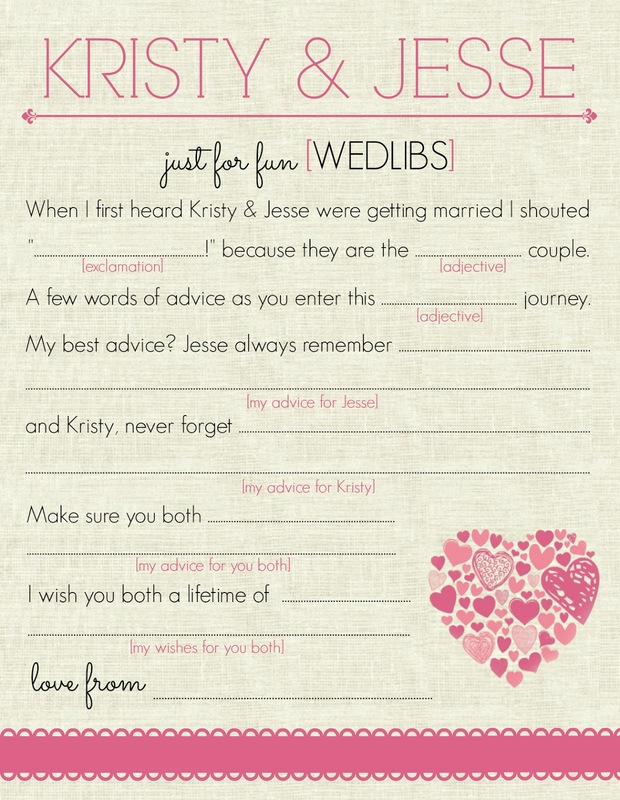 When I was looking at some ideas for little activities fun things at our wedding, the idea of having our own "Wed-Libs" cards sounded like a good idea. Wedding sneak peek: Our reception will be spread across two levels - a roof top and a ground floor level - and guests will be free to roam up or down, wherever they like. As we have so much space, I wanted to make sure there was something to entertain guests wherever they were. Mad-Libs are a light hearted and easy game which you can adapt to pretty much any situation - but I did them just a little bit differently. 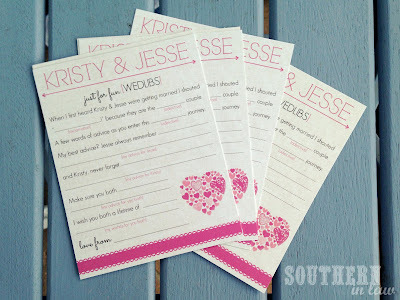 Rather than having a list to fill in words on the back like traditional mad-libs, I went for a simple "fill in the blanks" style where guests can add in whatever they choose. I looked on Etsy and found hundreds of Mad-Libs/Wed-Libs versions to purchase, however, as I'm launching myself into the world of graphic and invitation design, I decided to create all of our wedding printables ourselves. I designed the card myself, making sure the colours/fonts/style fitted with the rest of our themeing (another sneak peek!) and then tailored the text to ourselves. 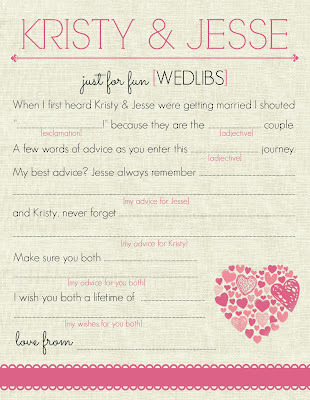 "When I first heard Kristy & Jesse were getting married, I shouted "..................!" because they are the ............. couple. A few words of advice as you enter this ................ journey. My best advice? Jesse always remember ........................................................................... and Kristy, never forget............................................................................................................. Make sure you both ................................................................................................... I wish you both a lifetime of ............................................................. Love from ..........................."
Before designing them, I made sure to find out Vistaprints' Specs for Postcard Printing and made them exactly to size - this way, all I had to do was upload my design and print them. I found Vistaprint postcards were the cheapest (and I tested out the quality of their printing on some other designs first!) and when I received them they were perfect! I ordered the Recycled Matte Postcards (which cost a bit extra) so that is was easy for our guests to write on the postcards. They arrived within a week and I ordered them at a time where Vistaprint had specials on (they always have specials on, so keep an eye out!) and saved heaps. Etsy Printed Cards: Up to $200 for 100 Printed Cards PLUS postage. But tell me, what did you DIY for your wedding? and if you're not married yet, do you think you'll be a DIY bride? Stay tuned for more of our DIY wedding projects and wedding sneak peeks! this is so cute! the guests will love them! I'm not married yet...my wedding is August 2014 but I will definitely be a crafty bride! I have already hand-made four bridesmaid askers and a pop up scene to ask my witness to be part of our day! Loving your Wed-libs and they will be great to look back through after the wedding!